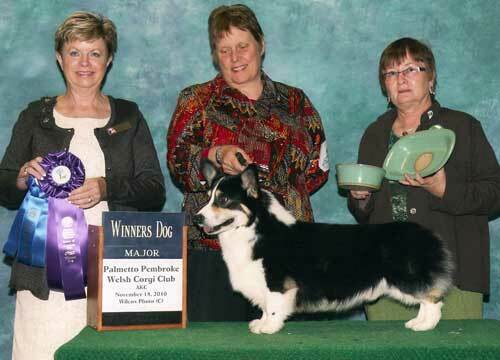 Jimanie, established 1968, devoted to the Welsh Corgi and the Pembroke Welsh Corgi in particular. I am a member of the Pembroke Welsh Corgi Club of America, Inc. and have served as a Board Member, Vice President and as Webmaster,, a member of the Welsh Corgi League (UK) , the founder of and past president, vice president, treasurer and actively serving as Webmaster of the Palmetto Pembroke Welsh Corgi Club, Inc., a member of the Columbia Kennel Club, Inc., lifetime member of the Greater Columbia Obedience Club, Inc. and a member of the American Dog Show Judges Association and the Dog Judges Association of America..
Jimanie's Phantom of the Opera "Andrew"
Andrew only recently 'came home' to Jimanie. He was sold as a show prospect at 12 weeks of age. He was spot-shown for a couple of years, but never campaigned seriously by his new owner. He had a couple of reserves, including at least one major reserve, but no points when his owner gave up and quit showing him. Since it has always been more important to me for my dogs to be part of a loving home, and I knew he was certainly loved by his owner, I never insisted that he be finished, though the last time I saw him, I certainly felt he was worthy of the title. A few months prior to the National, I got a call that Andrew's owner was undergoing treatment for cancer and could no longer care for him. She moved in with her son and his dogs would not accept Andrew into the pack. I took him back and the moment I laid eyes on him, I knew I would at least attempt to finish his championship. Andrew is 7 years of age, but looks and acts like a 3 year old. We lost his dam, Kathie Lee, last year at 14 years of age. Andrew is OFA#7136G43 , eyes are clear and his vWD and DM tests are pending. I had not seriously shown a dog in 10 years, so Andrew and I were "relearning" how to show together and we had a few reserves under our belt before coming to the National. My goal at the national was to place in the Bred by Exhibitor class. This show was dedicated to the memory of Michael Sauve, and BBE was "his" class. I was thrilled beyond words (a rare occurance for me) to win the Bred by Exhibitor Dog class. In Winners Dog, Andrew showed his heart out and we were finally working as a team! 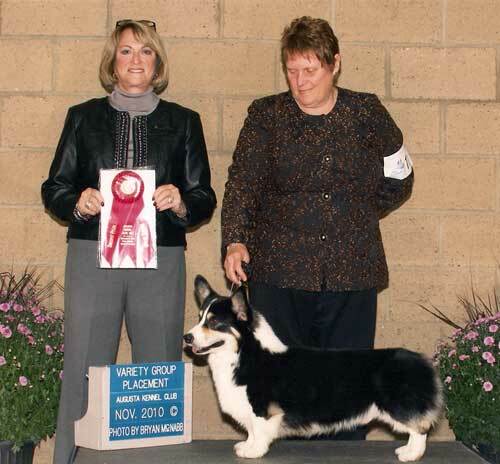 To go Reserve Winners Dog at the National was such a thrill for me and for Andrew's co-breeder, Linda Galphin (Foxllyn) and his co-owners, Denise Scott (groomer extraordinaire!) (Vache) and Linda Stoddard (Woodwynne). Looks like I will be showing a bit longer. I hope that we can finish his championship, but even if he doesn't, he's got a home at Jimanie for the rest of his life. Good boy, Andrew. GOOD BOY! ANDREW finishes his championship in grand style! 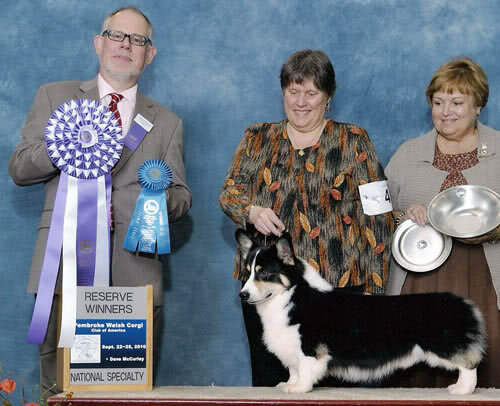 In five shows after placing Reserve Winners Dog at the PWCCA national specialty, Andrew took the show world by storm. We supported the local Augusta Kennel Club show where he took his first two points, and went Best of Breed and Herding Group 2 on Sunday. We then went to NC to show Andrew in the shows at Concord, NC. He started the weekend off with a bang when he went Winners Dog for a 5 point major at the Palmetto Pembroke Welsh Corgi Club Specialty show on Thursday under breeder-judge Terry Hansen Mitchell (Pinemeade). We were thrilled when he took the 4 point major the next day under breeder-judged Danelle Brown. He completed his championship by going WD and BOS over specials on Sunday for a final 4 point major which gave him the required 15 points. Andrew sired a few litters here and gave us our beloved girl, "Sweep" Trifecta Dress Rehearsal, out of the first Trifecta litter. He lives on in our pups to this day!